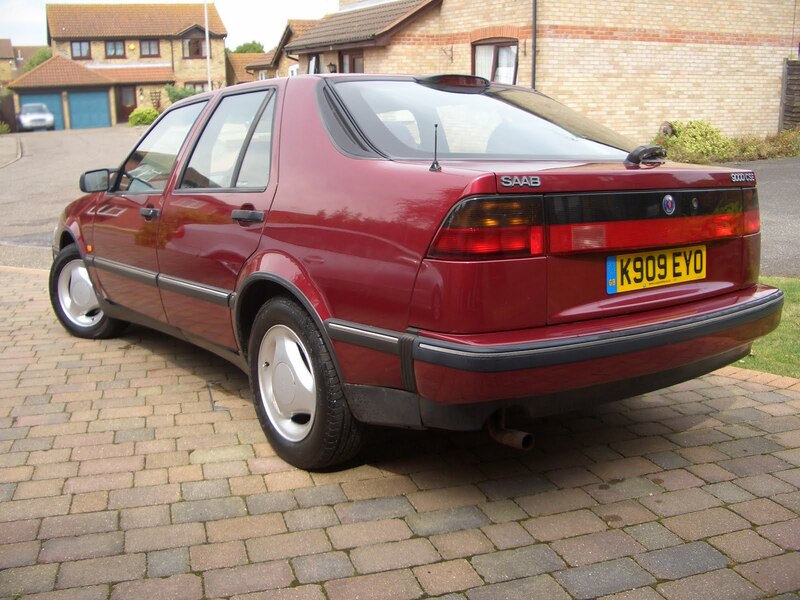 Chris Haining Writes: Fleet Review;- '92 Saab 9000 CSE retrospective. Fleet Review;- '92 Saab 9000 CSE retrospective. I had already handed in my resignation when my customer visited the dealership. He wasn’t in the habit of buying cars often, tended to buy a car that he really wanted and would then keep it for a long time. We hit it off immediately, I acted as "friend, partner, agent" and gave him all the help he needed in selecting his new car. There was no point in applying too much pressure, I would be off to pastures new, or at least unemployment in just three weeks time. In fact, this became my sales pitch. Profit margins weren’t of prime concern to me because I was leaving, so my customers were “more likely” to get a good deal from me than from my colleagues. It worked well, in fact I sold more cars in my final month than my previous two put together. On the day that he collected his new 3-Series Coupé, he approached me and asked what I was doing about a car after I had handed in my company one. I told him that I’d have to find something. 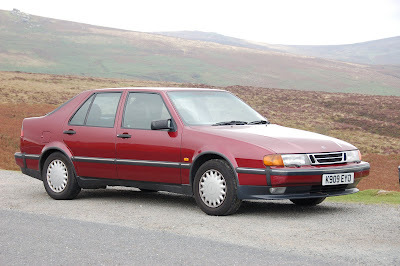 The previous week we had been talking about his car, a red Saab 9000CSE that he’d loved and cherished since 1992. The one in these photos. He had never intended to part exchange his car, he knew he’d make more money in a private sale. But I like to think that he placed more importance in it going to a good home than making hard currency. Knowing my plight, he offered the Saab to me for £300. I said yes immediately. I had effected a Trollhattan Transfer. I had always had a soft spot for 9000, despite knowing very little about them. I knew they had been around since the mid-eighties, and that they were born of the Type 4 family, the Fiat Croma, Lancia Thema and Alfa-Romeo 164 were its brothers and beautiful sister, respectively. And I knew they had been facelifted in the early nineties, an operation that gave it modish high-mounted rear light clusters and one of the lowest bonnet-lines of any car in production. From the age of 16 I knew that I wanted to own one, some day, but probably never would. It was another of these noble intentions that would never come off. Which is why I said yes, impulsively. I hadn’t even looked at the car properly, only spoken about it. Essentially I took him at his word that the car had been regularly serviced and was free of significant mechanical nasties. Very soon, on a sunny July day, I handed the keys for my BMW Z4 back to my sales manager, walked outside and drove away in a £300 Saab. And never returned. From that point on, every mile covered was a new adventure. Gut instinct told me that I had scored an enormous amount of car for very little outlay. My half hour drive home was a calm one, I was driving gingerly, making friends with my new steed. But I couldn’t resist playing with the buttons. This was my first ever car with heated seats (excluding my various company cars, but they don’t count) and I was free to warm my bottom just as much as I wanted. I could fart, too. This was MY car. If I had been a smoker, I would have done that, too. This was MY car. I pressed all the buttons. The air-conditioning blew cold, and I was pleased to discover this as I hadn't even checked whether it even had a/c in the first place. 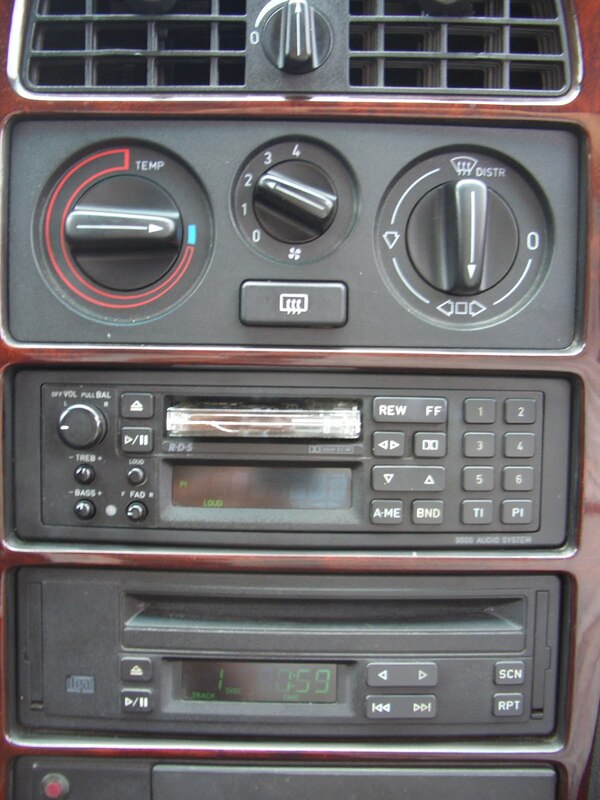 The radio cassette (yes!) player worked and sounded fine, and there was a separate single-disc player beneath. My car had a hi-fi stack system! I felt smug. And comfy. And proud. When I got it home for the first evening I set about looking around it with a fine toothed comb, looking for the inevitable horrors that £300 cars are imbued with. There weren’t any. The front bumper had a graze on it, the high-level brake light had a small crack across the lens. I went out of my way to find signs of rust, the only vestige I found was in the boot floor, a thumbnail patch of surface rust on the actual boot floor drainhole. This car was minter than it had any right to be. So flushed with pride was I that I drove straight to the Shell Garage in Clacton-On-Sea, where I took it through the car wash—twice. And then, paid for a jet-wash, too. I wanted to be rid of any salty grimness from any of the Saabs crevices and watertraps, and I left the garage with a reassuring mass of brown sludge left on the forecourt. With the car future-proofed to a certain extent, I could now get on with driving it. When I bought the car I didn't know anything about it, mechanically. Not even which engine it was fitted with. All I knew was that Saab had a rich history of turbocharged engines, and could often be very fast indeed. And, hey, this was a CSE. Nippiness was assured, surely? Pretty soon I realised that CSE didn't really mean anything, except perhaps for a forest of wood veneer across the dash. My 9000 didn't have a turbocharger. Not even a little one. And it was the smaller, two-litre engine, too. And, it had a four-speed ZF gearbox. Pretty soon I realised that this was a very slow car indeed. Over 13 seconds for the 0-62mph drag. A few weeks after taking the car over, it was pressed into service to take my Father and I on a camping trip to St Ives, almost four hundred miles away. We didn't have to take the Saab, Dad has a BMW 540iS at his disposal, but somehow going in the Saab felt like it would be more of an adventure. The 9000 was more or less faultless on that 700-mile roun trip. I discovered that there was an annoying seepage of wind through the drivers window leading to an annoying whistle above seventy, which could be solved by shifting the glass upwards a fraction using my palm. I would then repeat the process every five minutes until the end of the journey; it soon became second nature. The Saab proved to be less than economical, returning an average of 28.2 miles per gallon overall through the trip. I put that down to the widely-spaced ratios of its old-school automatic gearbox and the fact that it was connected to such a small, limp engine. The brochures promised that it originally corralled 136 horses, but either many of them were turned into glue years ago, or they were all lost in the gearbox somewhere, running around and around in circles. It was patently obvious that the Saab couldn't be driven fast, so there was no point even trying. I exploratively took it to 110 on the clock on a single occasion, but it had taken so long to get there, made so much noise and probably burned so much fuel in doing so, that I put it straight on my list of things to not do again. As a result, Saab ownership had quite a profound effect on my driving style. I would sit at only a little over seventy, not out of pious deference to road traffic law, but because it was the most relaxing way to travel. Chilled motoring was further encouraged by a CD player that worked brilliantly despite its vintage, and the large speakers dotted around the car (and made by Scandinavian name from the past, Luxor) was terrific. Over time I discovered yet more new delights. 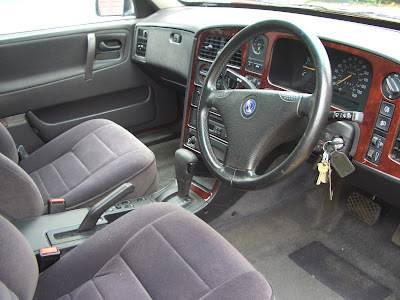 The glovebox and centre console binnacle were illuminated in anti-glare green. The seatbelt release buttons them selves lit up in red. A display on the dash told you the battery condition on startup, and the map reading light was brilliantly directional. The 9000's interior may have looked like a case study in 1980's design, but it was becoming a fabulous place to spend time. The enormous, accommodating seats were astonishingly comfortable, and the sun-faded velour pleasant to sit on. Occasional wind noise apart, it was fairly quiet once a cruising speed had been attained, and the heating and ventilation were excellent, but I'd love to know what the optional electronic climate control was like. It was a useful car, too. 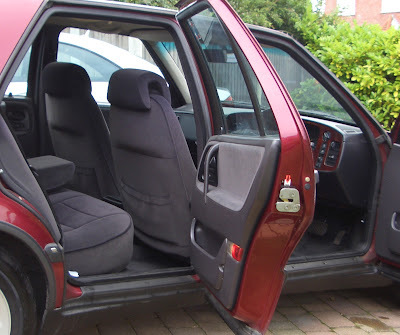 The boot was enormous, even enormouser with the rear seats folded flat, whereupon it does an excellent impression of a Ford Transit, should you unexpectedly find yourself struggling with flat-pack in a damp IKEA car park. This happened, and had my parents and I been in any of the other family cars, we would have been forced to throw money at a Man with a Van. Or stage an impromptu bonfire. I could never quite put my finger on it, but something was making me unnaturally fond of this car. It wasn't the handling, which was basically sound but for the fact that the front dampers were, with hindsight, a bit knackered; leading to alarming levels of pitch into fast bends. I usually solved this problem by just slowing down. And I enjoyed the strange noises that the gearbox made in the lower two ratios, an upwards whine in first, a downwards one in second. It sounded like a tiny version of those found in the Buses I'd travelled in through my time at Coventry University. I bought a set of model-appropriate three-spoke Saab alloys from a pleasant chap in Finchley. He came out to look at the car after hearing me gush with praise. “It's an auto”. His face darkened, his lips formed for an intake of breath that never came. The gearbox woes never came, certainly not during my stewardship of the car. I took it for an MOT where I discovered a split windscreen washer bottle; screenwash trickled straight onto the floor of the MOT centre, but the they couldn't fault me as the washer worked fine. In fact, the car flew through the test, not even an advisory. “Bloody lovely” the man said. It was. I improved the external appearance by fitting clear white front indicator lenses in place of the dated original orange ones. The car now looked great, almost sporty; or at least much less un-sporty than it really was. For the summer of 2007 I covered many miles in the Saab and enjoyed every one of them. I went to the Tokyo Motor Show that year, and found strangely comforting the fact that my Saab was waiting for me in a Heathrow Car-Park. It was like a dagger through the heart when a thieving scumbag threw a rock through the drivers window when I visited my cousin in Sheffield; they stole my TomTom Satnav but, more hurtfully, they'd damaged my car. MY car. My car that I loved. By February the following year I had started my next job, this time for Mercedes. This meant another company car. I was issued a CLK Convertible, and the Saab was sidelined. I still had the Saab for another six months or so, but hardly ever drove it as my attention was stolen by the shiny new German car on my driveway. It was my parents who insisted that I sell the Saab if I wasn't going to use it, and as I was living with them again, I was forced to accept their terms. 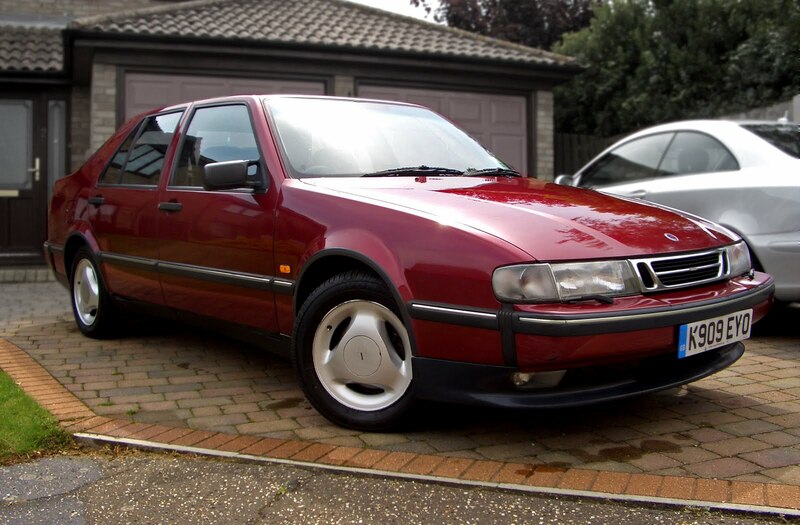 It was a difficult decision, but the Saab was soon listed on eBay with a reserve of £300, what I had paid. Up to now my Girlfriend had never travelled in the Saab, I swept her off her feet and straight into the leather-lined interior of a CLK, but I took her out in it just once before I sold the car. I took her for a short journey just in and around her town, long enough to build up an impression; I pointed out all the features and foibles of the car that had enamoured me so. She humoured me, of course, but conceded that she totally understood why I didn't want to sell it. I had no choice, though, and the eBay gavel fell at £450. Its kindly new owner would collect it that evening. The evening before the auction concluded, I took the Saab out for a drive, for old times sake. Selling it felt like the wrong thing to do; it didn't feel like our time together was ready to end. And then I switched the stereo on. A George Michael song was playing on evening radio; a track that I hadn't heard for ages. It contained the refrain “I can't make you love me, if you don't”, and that was almost too much for me to take. Suddenly sentimentality got the better of me. I was starting to humanize the car far too much. I was getting thoughts my of previous relationships and how they ended, mixed strangely with the act of parting with the car. The Saab was talking to me, summing up how it saw our relationship and why I wanted to end it. But it was wrong; I did love it, but we were were destined to be star-crossed. We couldn't stay together. I can't stand this kind of emotional blackmail from any car, told it to not do this to me, switched the radio off, and drove straight home. I knew that was it. If I took one more drive in that car I'd never want to get rid of it. If I was going to move on, I had to go cold turkey on the Saab. This was the only time this has ever happened to me, usually common sense wins over soppiness. This time, though, the car had got so far under my skin that parting company would be heartbreaking. I turned the key to lock the car up for the night, and never drove it again. I've always liked the Saab 9000, you still see the odd one on the road.